AGC (Asahi Glass), Japan recently announced the launch of UV Verre Premium Privashield, newly developed automotive glass for rear doors and rear windows that cuts approximately 99% of ultraviolet (UV) rays and also protects from infrared (IR) rays. By this addition to the product line, AGC has achieved the world’s first approximately 99% UV-cut for all windows covering all directions. 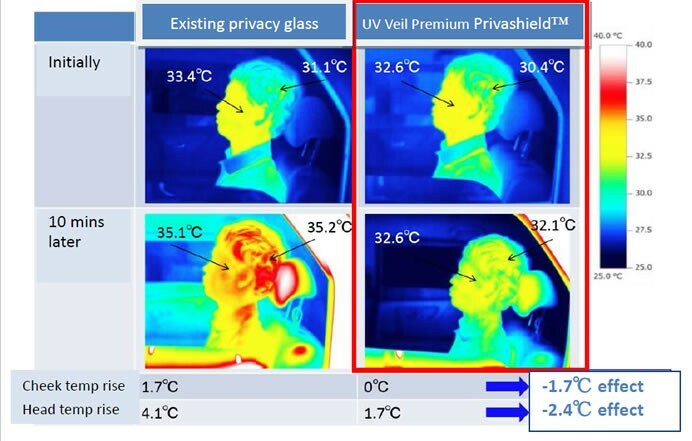 UV Verre Premium Privashield employs the same highly praised functionality as these products to protect passengers in the rear of the vehicle. By using this with front door glass UV Verre Premium Cool on and windshield glass LAMISAFE or Cool Verre, consumers can enjoy approximately 99% UV cut with all windows, protecting the skin of not only the driver and front seat passenger but also the rear seat passengers. AGC released the world’s first approximately 99% UV-cut glass for front door windows, UV Verre Premium, in 2010, followed by UV Verre Premium Cool on in 2012, equipped with additional function to reduce the burning sensation of the skin caused by IR rays. These products, developed to meet the UV and IR-cut needs of consumers with rising consciousness towards health and beauty, are used in about 50 car models of major automobile manufacturers in the Japanese market.